A hot air balloon is a type of aircraft. During the French Revolution, and the American Civil War, hot air balloons were used for spying on the enemy. The hot air balloon consists of three parts: an envelope – which contains heated air, basket or gondola, and burner system which creates an open flame by burning a mix of liquid propane and air. Richard Branson took the longest hot air balloon flight on record leaving Japan and arriving in Northern Canada. His hot air balloon speed also set a record at 245 miles per hour. The basic principle behind hot air balloon physics is the use of hot air to create buoyancy, which generates lift. Hot air balloons are used primarily for recreation today. Hot air weighs less than the same volume of cold air (it is less dense), which means that hot air will rise up or float when there is cold air around it, just like a bubble of air in a pot of water. Some hot air balloons are designed to look like animals, various objects and even cartoon characters. The hot air balloon is the oldest successful human-carrying flight technology. There are many hot air balloon festivals held around the world including those held in Turkey, New Mexico, Egypt and Tanzania. The first untethered manned hot air balloon flight was performed by Jean-François Pilâtre de Rozier and François Laurent d’Arlandes on November 21, 1783, in Paris, France, in a balloon created by the Montgolfier brothers. In 25 minutes the two men traveled just over 8 kilometers (5 miles). King Louis XVI had originally decreed that condemned criminals would be the first pilots, but de Rozier, along with the Marquis François d’Arlandes, successfully petitioned for the honor. There was once a duel between two Frenchmen in Paris in hot air balloons. They were both in love with the same woman and in 1808 they took to the skies in hot air balloons to fight it out. Both tried to shoot each other's balloons down. One succeeded and the other plunged to his death. The first hot air balloon flown in the United States was launched from the Walnut Street Jail in Philadelphia on January 9, 1793 by the French aeronaut Jean Pierre Blanchard. The next great challenge was to fly across the English Channel, a feat accomplished on January 7, 1785 also by Jean Pierre Blanchard. The first aircraft disaster occurred in May 1785 when the town of Tullamore, County Offaly, Ireland was seriously damaged when the crash of a balloon resulted in a fire that burned down about 100 houses, making the town home to the world’s first aviation disaster. Modern hot air balloons, with an onboard heat source, were developed by Ed Yost, beginning during the 1950s; his work resulted in his first successful flight, on October 22, 1960. Champagne became tradition after a flight as a way to make farmers happy after a hot air balloon landed in their fields destroying their crops. The champagne made them happy and smoothed tensions between the French aristocracy and peasants. Baskets are commonly made of woven wicker or rattan. These materials have proven to be sufficiently light, strong, and durable for balloon flight. Most hot air balloons are made of nylon now. The melting point of this material is approximately 230º C (446º F). 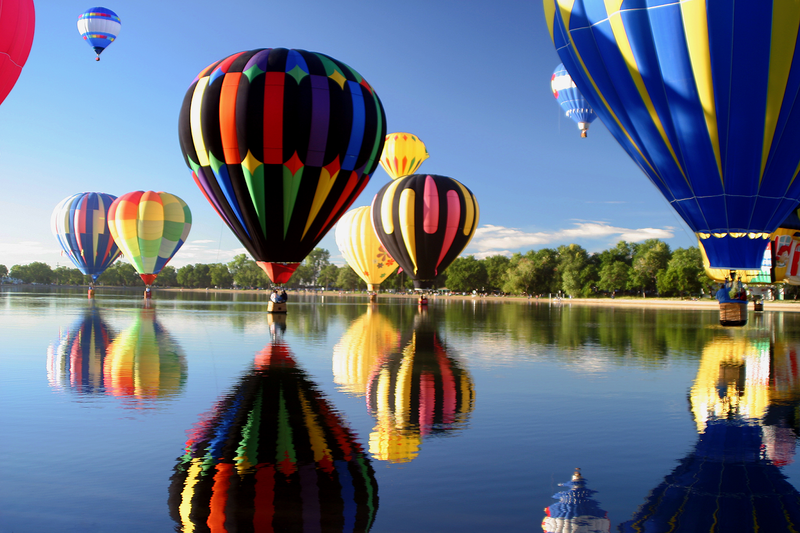 The temperature inside a hot air balloon is usually kept below 120º C (248º F). While most envelopes have inverted tear drop shape others are designed to look like animals, cartoon characters, pirate ships, and other fun objects. The world record for height reached in a hot air balloon is 68,900 feet. As with all aircraft, hot air balloons cannot fly beyond the atmosphere. On November 26, 2005 Dr Vijaypat Singhania (India) set the world altitude record for highest hot air balloon flight, reaching 21,027 meters (68,986 feet) in a Cameron Z-1600 hot-air balloon over Mumbai, India. With a volume of 74,000 cubic meters (2,600,000 cubic feet), the ‘Virgin Pacific Flyer’ balloon envelope was the largest ever built for a hot air craft. Designed to fly in the trans-oceanic jet streams ‘Virgin Pacific Flyer’ recorded the highest ground speed for a manned balloon at 394 km/h (245 mph). Hot air balloons can't be used in the rain because the rain hitting the balloon's material would boil from the heat and destroy the fabric. Most balloons (envelopes) are made from nylon. The melting point of this material is approximately 230 degrees Celsius. The temperature inside the balloon is usually below 120 degrees Celsius. On January 15, 1991, the ‘Virgin Pacific Flyer’ balloon completed the longest flight in a hot air balloon when Per Lindstrand from Sweden and Richard Branson of the UK flew 7,671.91 kilometers (4,767.10 miles) from Japan to Northern Canada. Bertrand Piccard and Brian Jones guided the balloon Breitling Orbiter 3 up and away from the Swiss Alpine village of Chateau d’Oex at 8:05, GMT, 1 March 1999. They landed in the Egyptian desert 19 days, 21 hours and 55 minutes later (21 March 1999), having traveled a distance of over 46,670 kilometers (29,000 miles) and completed the first non-stop flight around the world with a free balloon. Jean-Francois Pilatre de Rozier was the first person to die in a crash, only two years after he took the first successful flight in human history. His balloon exploded while attempting to cross the English Channel. Fedor Konyukhov flew solo round the world on his first attempt in a hybrid hot-air/helium balloon from 11 to 23 July 2016 for a round-the world time of 272 hrs 11 mins (under 11 days). He exceed the record for briefest time traveling around the world. Jean-Francois Pilatre de Rozier and Francois Laurent d'Arlandes were the first pilots to fly a hot air balloon, and the first people to fly in a man-made machine. In 2014, a giant hot air balloon was manufactured by Cameron Balloons of Bristol. It carried 32 passengers to claim the world record for the largest certified passenger carrying balloon. The oldest person to fly in a hot air balloon Emma Carrol (USA, b. 18 May 1895) made an hour-long flight in a hot air balloon at Ottumwa, Iowa, USA, on 27 July 2004 at the age of 109 years 70 days. The largest number of hot air balloons to take off at once was 408. This took place on July 31st 2013 in France at the Lorraine Mondial Air Balloon gathering. Prior to the first human flight in a hot air balloon in 1783, a flight took place with animal passengers including a sheep, duck, and a rooster. Their flight lasted about 8 minutes. Hot air balloon festivals are held annually in many places throughout the year, allowing hot air balloons operators to gather- as well as for the general public- to participate in various activities. They can include races; evening “night glows”, in which balloons are fired while remaining tethered to the ground; and rides. Hot air balloons were invented in the 1700s in France but unmanned balloons had existed in China in the Three Kingdoms period of 220-280AD. The world’s largest hot air balloon festival is hosted in Albuquerque, New Mexico, each year. The festival lasts nine days and features more than 500 hot air balloons. Hot air balloon flights are not possible in the rain. This is because the heat inside of the balloon can bring rain to boiling temperatures on top of the balloon, thereby destroying hot air balloon fabric. Solar balloons are hot air balloons that use just solar energy captured by a dark envelope to heat the air inside.